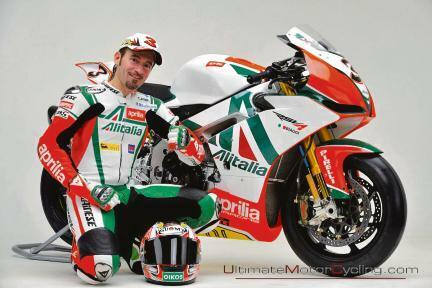 ﻿ Meet Max Biaggi at Silverstone! Meet Max Biaggi at Silverstone! Aprilia is running a competition to meet Max Biaggi, Leon Camier and be a VIP guest of the factory team at Silverstone's WSB round. All you have to do to win? Be one of the first 20 to buy an RSV4 before the end of the month, OR be an MCN reader. That's right - we've got two VIP packages to give away whether or not you're about to sign on the line for the WSB-leading V4. All you have to do to enter is click here and answer this question: How many double wins has Biaggi scored so far this season? Want to make sure? The Aprilia RSV4 Factory and R versions are available on a two-year PCP at £175 per month, or on 0% with a 50% deposit. Contact http://uk.aprilia.com/ for further details or contact your nearest Aprilia RSV4 dealer.